Yes, you read that right. Vegan Fried Egg. No, Sam has not turned into a mad scientist this week, but she has turned into a craving stomper. When I posted my recipe for Vegan Toast Dipping Sauce (which is basically a vegan egg yolk), 2 things happened. I got flooded with messages from people raving about the vegan egg sauce but also asking if I could make a fried egg version. Craving stomper Sam, here to the rescue! 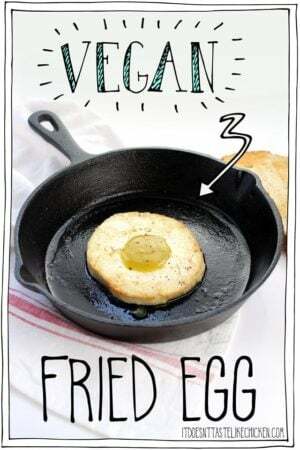 For my vegan friends who crave a fried egg, for anyone who wants to try an easy, fun, and playful recipe, or for a great April fool’s day breakfast, I bring you my vegan fried egg. And guess what, it’s actually pretty darn eggy tasting! 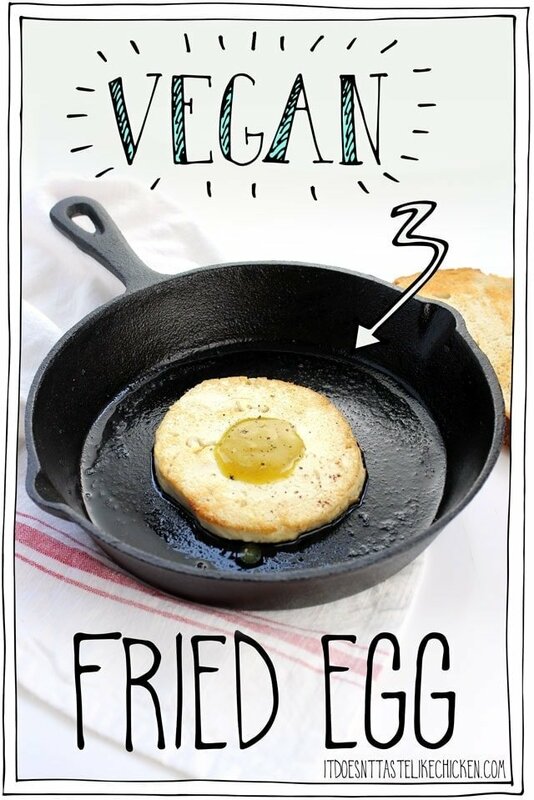 To make a Vegan Fried Egg: Turn the block of tofu on its side and cut into 4 thin slices. Use the tip of your knife to cut off the corners of the tofu making it a rough circle. You could alternatively use a round cookie cutter, or just leave it as a rectangle. 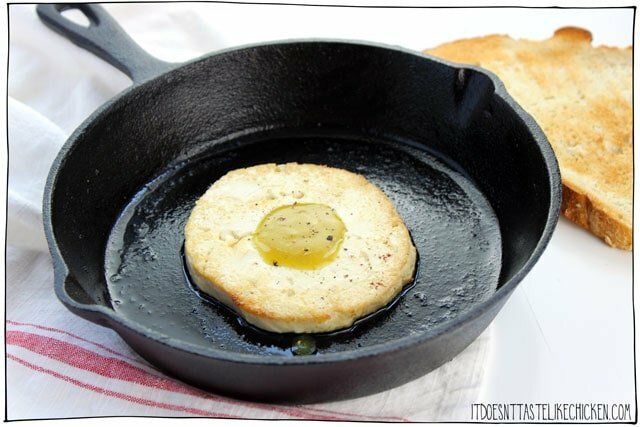 Melt the vegan butter in a frying pan over medium heat. Add the tofu slices in a single layer (you may have to work in batches). Fry the tofu a couple of minutes per side until lightly browned around the edges, flip and repeat on the other side. 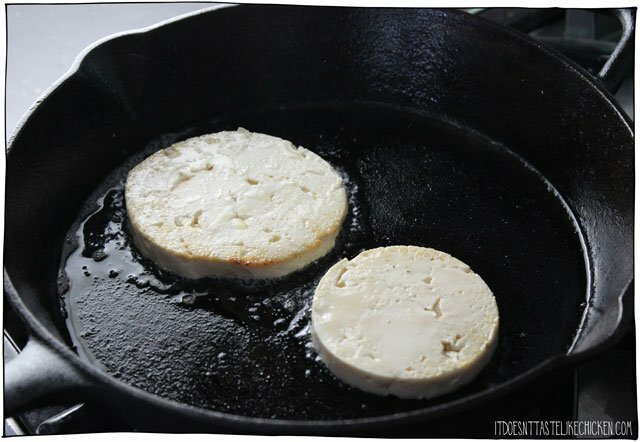 Once the tofu slices are cooked, remove from pan and place directly onto plates or serving dishes. Use a small round cookie cutter, a shot glass, or the tip of your knife to cut a small circle in the middle of the fried tofu slices. 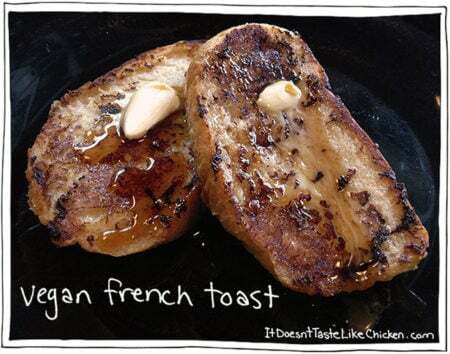 Serve the slices on a plate and fill the holes with the Vegan Toast Dipping Sauce. Garnish with salt and pepper as desired. You can serve any leftover dipping sauce in a small dish on the side. Easy to make with a runny vegan egg yolk! 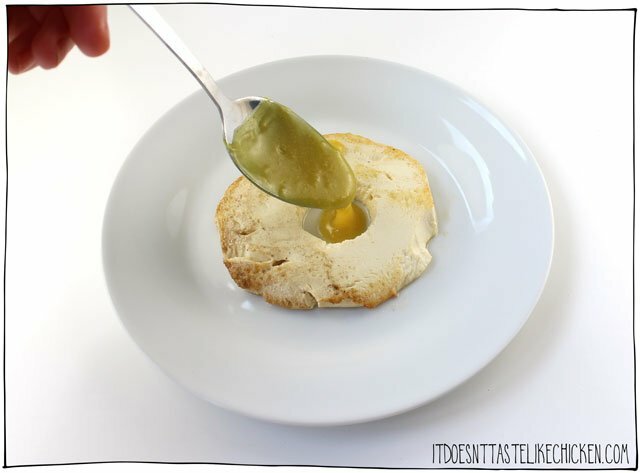 Great for anyone who is egg-free but misses this breakfast treat, or perfect for April fools day! Turn the block of tofu on its side and cut into 4 thin slices. 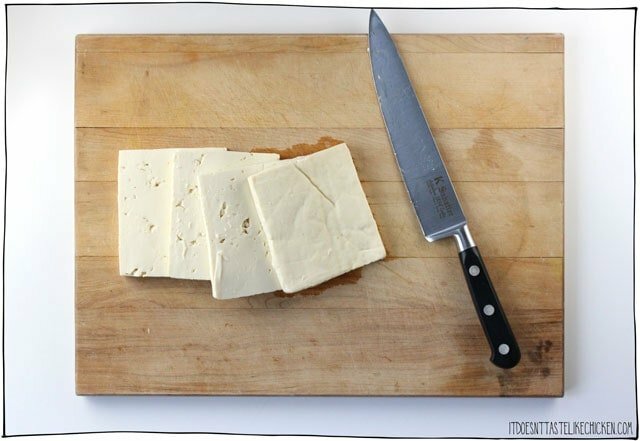 Use the tip of your knife to cut off the corners of the tofu making it a rough circle. You could alternatively use a round cookie cutter, or just leave it as a rectangle. Melt the vegan butter in a frying pan over medium heat. Add in the tofu slices in a single layer (you may have to work in batches). Fry the tofu a couple of minutes per side until lightly browned around the edges, flip and repeat on the other side. I’ve been making this recipe every weekend for the past 4 weeks! 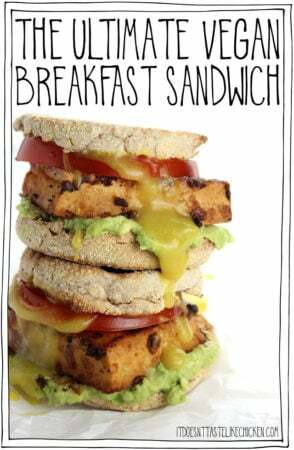 I have had it on avocado toast, in a “bacon, egg and cheese” and with “bacon” and pancakes. I absolutely LOVE it. I like to additionally, on top of making the toast sauce eggy with black salt, rub a thin and gentle layer of the salt onto the tofu before frying it up. 🙂 Ugghhhh getting hungry thinking about this! Is it breakfast time? This “yoke” sauce is AMAZING!! Only wish I bought extra firm tofu to stay together better. So happy you enjoyed, Courtney! The only thing I miss since going vegan several years ago is fried eggs, but not anymore! These are even more delicious than real eggs, but without all the health damaging ingredients of chicken eggs. I will be making this recipe every day for many years to come. Thank you! This was absolutely DELICIOUS!! I’m newly vegan and I love eggs all time of the day. This really satisfied my craving. I was literally contemplating going back but your website has awakened my vegan taste buds. Fruits, veggies, smoothies, and oats were all I was really aware of and I was starting to get a little worried! You have helped sooooo incredibly much! I can have “eggs” and grits now lol! Whaaaat! Ok… that looks crazy awesome and crazy delicious! I think it’s on my New Year’s Brunch menu. So excited! I tried this recipe today and it was awesome; flavor, consistency, and texture were just lovely. 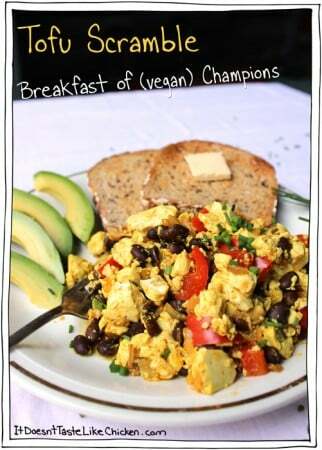 Also found what was missing from my own made up tofu scramble recipe: black salt and nutritional yeast. Thank you!!! Made your Pulled Jackfruit last night…loved it!!! Question about using tofu in your scramble and vegan fried egg, do you press your tofu first? Hi Vanessa, thrilled you are enjoying my recipes so much. I always include all instructions in my recipes, so if it doesn’t say to press the tofu, than there is no need 🙂 EnjoY! Just ordered your cookbook!!! Can’t wait for it to arrive! This is amazing! Much better than I thought!! Thanks! made this with a firm silken tofu, HIGHLY RECCOMEND!! the tofu gets crispy on the edges, and comes out almost exactly the consistency of egg whites! i really wasnt ready for this to be so perfect. that yolk sauce is amazing!! I’ve been dying to make this, and finally had the chance today. It’s absolutely fantastic! 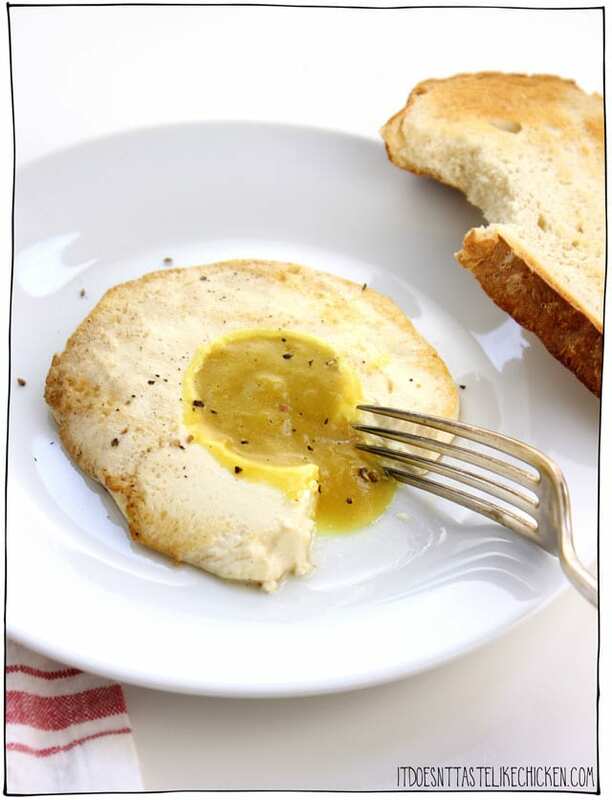 From the tofu slices that were reminiscent of the fried white part of the egg to the yummy runny yolk, it made for a fabulous breakfast for dinner. The only problem with my yolk was that it came out a bit too green in color. Was it the turmeric perhaps? That’s awesome! So happy you enjoyed it, Lillian! I’ve heard some people say their yolk has come out a bit green because their black salt is actually quite black. So that could be the problem perhaps? This has seriously changed my life!! I made the dipping sauce a couple weeks ago and finally got around to making the fried egg today. Delicious doesn’t even begin to cover it!! I have yet to make a dish of yours I didn’t love! You are a genius!!! Super yum! This looks amazing!! If you’re looking for ideas, and we are still on the topic of eggs, I really miss quiche. I used to make a quiche for myself every so often, and eat the whole thing… over a couple of days. I am trying to embrace a vegetarian/vegan lifestyle (I know that vegetarians and vegans are different but it’s a start). I have always wondered why vegans/vegetarians preach against eating animals/animal by-products but try to simulate the very thing they are against. It seems very counterproductive and confusing. Please enlighten me, thanks. Although food that attempts to emulate animal products is not really my thing either, I will try to enlighten you as to why some people turn to these, if I may. Most people go vegan because a) they don’t want to cause suffering to animals or b) they believe it is healthier for them. They needn’t necessarily dislike animal foods. They realise that they are morally wrong and/or bad for them, and they are perfectly willing to give them up for moral or health causes (mind over matter kind of thing), but they might miss the taste, the look of them etc. Food is a complex thing, it’s not always just about nourishment but has a social and emotional component too. You might remember the fried eggs that your granny used to fix you for breakfast when you were a kid and feel sad that you can never have them again, like you are losing a connection with her, for example, It’s important to remember that people who are trying to transition to veganism are doing their best and deserve support and kindness. What they don’t deserve is to be called out for their food choices. I appreciate the reply to my question, thank you. I wasn’t calling anyone out on thier food choices, mearly trying to make sense of a few things. vegetarian category because I am finding it very hard to give up eggs and dairy. To me, I find that trophy hunting, hunting for Chinese medicine and animals killed for vanity (fur, leather,etc) as the most cruel over animals raised for meat on farms because the whole animal is not being used and vanity doesn’t feed people. I would prefer to know that an animal raised for meat had a long and healthy life and was treated humanely in the end. This is why I am trying to embrace a different eating lifestyle because I cannot guarantee that that animal went in the most humane way possible. Yes I have seen very horrible websites that show how cruelly we treat animals. I am still having a hard time letting go of the eggs and dairy and I am open to alternatives. I originally cut out meat because I ha IBS and nutcracker esophagus which greatly limits my diet. I cannot eat beans and lentils, hot peppers and acidic fruits and vegetables, it causes great discomfort and causes me to vomit if I do ingest them. That is why I like dairy it is mild, low acid and creamy. Do you have any suggestions or recipes that mimic dairy products or recipes that are low in acidity? I would greatly appreciate it.Thank you. Amazing explanation. I had the same question and you answered it perfectly. Thank you . That’s right, Ana explained it very well. The thing is I don’t know a single person who went vegan because they hated the taste of animal products. 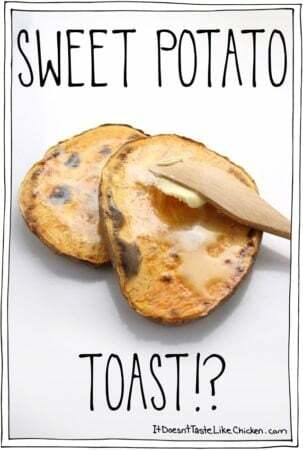 Since posting this recipe, (and other similar recipes), I have received a ton of emails and comments from fans who said the only thing they missed since going vegan was eggs, and now they can finally enjoy that treat again. And even better I have even received a few emails from people who were vegetarian, such as yourself, who now finally feel like they can give up eggs and dairy and make the switch to full vegan. 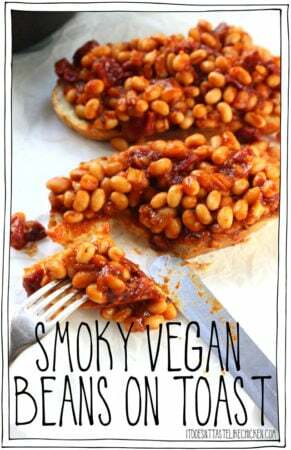 Recipes like this allow people to still enjoy some of their favourite foods while no animals are harmed. It’s really win-win. And if it’s not your thing, you certainly don’t have to make it, but if it helps people be happy vegans, I’m all for it. That’s awful and I’m sorry you have to deal with that. I’m not a medical professional and you must do your own research and consult medical professionals as you see fit, but I firmly believe, and have seen many evidence to support this belief, that dairy is a contributing factor or even the underlying cause of many chronic illnesses. I have met many people in real life and online who have been able to cure chronic conditions like Parkinson’s, diabetes and Crohn’s (which is similar to IBS) by transitioning to a vegan or raw vegan diet. There’s something called the Medical Medium Protocol that is very restrictive in terms of foods that are allowed and I’m sure it would be very difficult to follow, but I know several people with Crohn’s who swear it helped them when nothing else could, and I would personally definitely give it a try if I suffered from such a condition. As for typical vegan foods that you might try, there are a number of dairy free yogurts, milks cheeses and so on out there (almond, coconut etc based, if you can’t handle soy), but those are essentially processed foods and I would recommend sticking to plant based whole foods instead. That would mean not looking for things to mimic dairy, but replacing it with plant based whole foods that will fill you and not give you stomach trouble. My number one suggestion would be cream soups (cauliflower, zucchini, any kind of squash, carrot, sweet potato, and any other vegetables you normally eat, or any mix of the above, just cooked in water with a bit of salt and olive oil and pureed with an immersion blender). Of course, you may add any spices that you know are ok for you. Such soups are highly nutritious and can be prepared in larger amounts and just pulled out of the fridge/freezer when you’re hungry. You can throw in oat-flakes, rice etc for creamier texture and more calories. Or it doesn’t have to be a cream soup, you can make a regular soup with chunks of veggies like kale, potato, carrot, onion… I would also suggest rice, quinoa, buckwheat, and any other grain you know you can handle in a stir fry with veggies that are acceptable to you (mushrooms, leek, sweet peppers, eggplant), maybe with an addition of tofu. I’m not sure if you can have that, since its made of a legume, but it’s not a legume per se, but if you can, tofu is a great protein source and I think it is very mild and should not give you stomach trouble. It can be prepared in a number of ways (fried, baked in oven) and it makes a great meal in my opinion with a salad or some veggies on the side. You could make smoothies out of non acidic fruits you know don’t bother you, avocados, bananas, mangoes, melon come to mind, but of course you know best which fruits do not upset your digestion. Now this might not seem like much of a variety but I can tell you that 95% my diet for the past 2 years has consisted of the things I listed above and I have never been healthier or felt better. And I never felt like I was missing out on anything. The decision is ultimately yours and I wish you all the best no matter what you decide. And another important thing: with a little bit of googling you can find amazing online communities to get recipes, support and anything else you might need from! How about using a donut cutter, it is it too narrow of a ring, with too big center hole? My husband and I have been Vegan for about 1 month now. I know he will be happy about this. This sounds so yummy! I bet it would taste even more eggy if you used black salt! 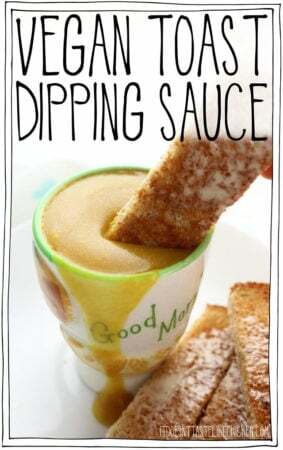 Scratch my comment, I just noticed that your French toast dipping sauce contains black salt! Perfect! Genius, genius, genius. I wish I had thought of that but I was entirely too busy stuffing my face with the dipping sauce, because of course I was. I may or may not have been making it every day. (I totally was.) What a great idea this was, and it is soooo good. Maybe now my husband will stop asking me why there is so much tofu in the refrigerator, and just eat the eggs!